With the start of a new year, I take the time to set my focus for the coming year. I believe that by being selective about where I direct my energy, I can achieve results that are exponentially greater than if I split that energy across many different goals. 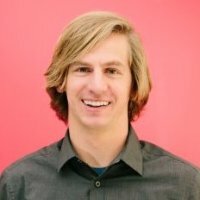 I detailed my 2018 focus here (read that first if you want more context). Here is how I’m progressing. This theme fits nicely with the goal I had set for the second half of my sabbath year (Jan-July) – evaluating the options for our life. This was by design. As such we have put a lot of energy into the theme outside of the specific named challenge, habit and exemplar. This means that I’ve done less with those than I would have wanted, but still stayed on theme. To touch on three items from the theme. Earlier in the year I made a really difficult decision between two jobs that presented very different lifestyles. Doing that forced me to think hard about what I valued, to ask my wife to do the same and for us to make a decision together. This was a fruitful exercise because beyond helping with this one decision, it helped direct our focus away from a whole swath of things that are similar or even farther in a direction we don’t wish to be heading. On top of the above decision, we’ve been spending a lot of time evaluating neighborhoods. Over the course of our marriage we’ve lived in the middle of the most expensive city in America, in the city-suburb of another, in a small town and now we are in what is best described as a bedroom community. We’ve learned to love things about all of those but unfortunately our favorite parts are often in direct conflict – we love the outside space on the farm, but it is 10 miles to the nearest store, good luck not having a car. By spending a few hours at a time in various neighborhoods, looking at them with a critical eye, we feel we’re narrowing in on the features of a place where we can thrive. How I earn an income and how we structure our days has been an item I’ve been thinking a lot about. I’ve held an ideal in my head for a while of running a business that my whole family could be involved in. The right type of business could get the kids involved, which would teach them hard work, give them real world context a classroom can’t, give us flexibility, allow us to be together more and leave our family with an asset that was as valuable as we made it. The trouble is, our family might not be a great fit for that kind of model. Our kids are all really young and on the wild side, I can’t really focus when they are around and my potential earnings are simply higher in certain jobs than they could be in any sort of family business. Going back to work recently has helped me realize this. While this feels like it closes some doors, perhaps it is just temporarily. Now for the named items. I haven’t done very much at all on my challenge for the year yet. I brainstormed about a dozen different types of families I’d be interested in speaking to; a car-free family, a nomadic family, etc. and for a few of them I put some names down. I’ve yet to contact anyone, start interviewing, write the profiles or figure out where I will host them. I am behind the ball on this one. The habit item of my yearly focus used to be the one I was most likely to fall short on. Last year I changed the way I did things and the results have continued to be very effective. For the first quarter of the year, I needed to have completed three devotion times per week for it to have been a success. This was the case for 9 of the 13 weeks. A pretty decent start. Of note, on no week did I complete more than 3, meaning things will get more difficult in the second quarter of the year when it will take four devotion times per week to be counted a success. 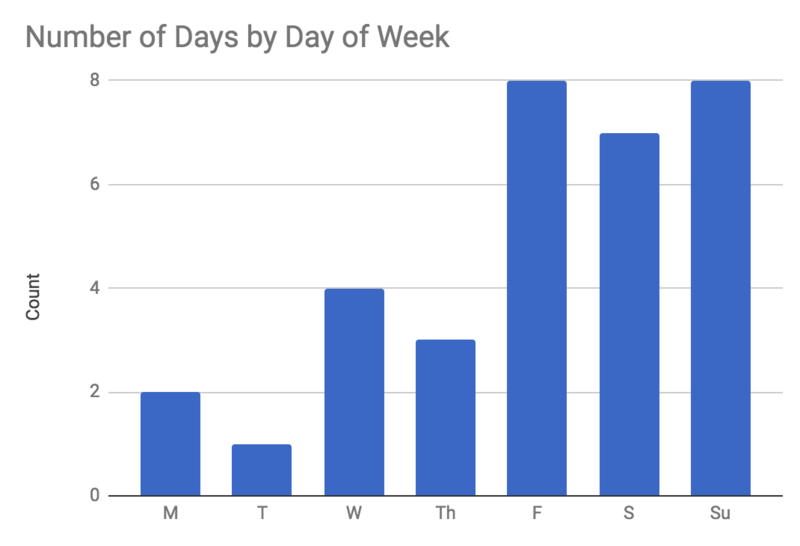 To highlight my procrastination, here is a chart showing the days of the week and how many times I had a devotion time on each. Friday is usually the day I realize I have zero for the week and need to hit all three remaining days in order for the week to count. You might notice, Tuesday, Thursday and Saturday are a bit lower than the days next to them – those are usually the days I run and so am more time crunched. One thing I noticed is a clear tension in timing of the ideal time for the impact and the ideal time for my schedule. I much prefer the impact of doing devotion time in the morning – it starts my day off better and my mind is not yet full of the days worries so I can really focus. The trouble is that if I don’t wake up early, I will get interrupted by rising children before I am finished. On the flip side, doing devotion time at night works really well with my schedule. It is a good way to calm down before going to sleep and I rarely get interrupted. Balancing these two factors is something I want to keep an eye on in the coming year, so I am going to start recording am/pm instead of just an ‘x’ on my tracker. I have yet to do much here. A library book search turned up some great collections of Muir’s essays, and autobiography and even an illustrated kids book. I read the latter to my boys one night and put a bookmark into the former. I will need to do more in the coming months. I do have a camping trip to a national park planned as well as a run that passes through Muir Woods. More details about the process are in this blog post and you can review the results from past years (2013, 2014, 2015, 2016 & 2017). The idea of first principles thinking is to remove preexisting assumptions and to build towards a conclusion from the ground up, challenging and testing every brick as you build. A first principles lifestyle would be one in which all aspects of that life are chosen intentionally because they are the most effective ways to achieve a person’s goals. A life in which everything has been stripped back to the foundation and rebuilt intentionally. That life might look very unique, or it might not, its roots would be in the goals it is true to rather than how anyone else does or has done things. This will be my theme for 2018 and I intent to spend time challenging assumptions I have about life, learning about the lives of others who are living first principles lifestyles and work towards defining a life that I can see our family adopting for years to come. Relating to that theme, my challenge for this year is to profile 12 families, that have 1+ kid(s), that I consider to be living first principles lifestyles. People that have decided what is important to them and crafted lives that strip away all else to emphasize those things. People that have figured out how to do so while also having children, which makes everything a bit more challenging. This will be challenging for me because it is the biggest writing project I’ve taken on where I am not writing about first hand experiences. I’ll have to get much better at getting the information I need ahead of time, rather than being able to pull it out of my mind as I’m writing. As I think about first principle living, one aspect that is foundational to the way I live and needs to be at the heart of future changes is my faith in God, His commands for how His people should live and the path He has uniquely set before our family. I wrote in my 2017 end of year review about how last year’s exemplar, Eric Liddell, was emphatic on the importance of a daily devotional time. I believe that he was able to draw an unearthly amount of strength from that connection and I know that I may be asked to do the same. My daily devotional time stands out as one way I can continually invest in; understanding God, seeing His will for our family and drawing strength from that. Despite the importance of this practice, this time is something that has come under fire for me as work, children and commitments have chipped away at the times I used to find ideal to set aside. My habit for 2018 will be spending time in daily devotion: reading the Bible, praying, reading devotionals and reflecting. The goal will be to complete the habit a certain number of times per week and at the end of the year I will look back on how many weeks were successful. The number of days per week will start at three during the first quarter of the year and grow by one with each quarter, ending at 6 in the last quarter. The hope is that the progressive difficulty will make the goal achievable while slowly chipping away at obstacles that stand in the way of the end goal. As I think about building a lifestyle from first principles, I wanted an exemplar that lived a life driven by their core values, even if it that resulted in it looking very different from their contemporaries. One such man is the naturalist, author and philosopher, John Muir. Over one hundred years after his death, it seems appreciation for his lifestyle and the things he loved is still growing. He was on to something big long before anyone knew it was something at all. Most famous for being “The Father of Our National Park System” and the founder of the Sierra Club, Muir also balanced aspects of a more traditional life, running a family business, being a husband and father of two girls. I’m interested in learning more about how he discovered his passions, how effectively he balanced them across his life, and how he was able to create a legacy that has lasted for over a century. It helps my interest that we share a common passion – I’ve spent a good bit of time over the past decade on land that his efforts helped preserve. Perhaps during this year I’ll make a point of visiting a bit more.